What’s The Best Credit Card to Use at Amazon.com? According to research done by Consumer Intelligence Research Partners, there are now about 40 million US Amazon Prime members in the U.S., who each spend about $1,500 a year on average. Amazon.com Visa cardholders, who represent about 15% of US customers, spend even more than Prime members, possibly encouraged by the 3% rebate they earn on Amazon.com purchases. The question is–with all the money they spend, can Amazon.com Rewards Visa Card members do even better than 3%? In this post, we explore many alternatives that offer more cash back, including one that Amazon introduced just in the past week. Rewards are earned as points, which can be redeemed for purchases at Amazon.com, cash back, gift cards or travel. This past week, Amazon updated its Amazon.com Store Card. Now, when you’re approved for the Amazon.com Store Card and are an Amazon Prime member, you will be instantly upgraded to the Amazon Prime Store Card, which offers the option of earning 5% cash back on all Amazon.com purchases. The Amazon Store Card is issued by Synchrony Bank, formerly known as General Electric Bank, and has no annual fee. This is a store card and can only be used at Amazon.com. As such, you won’t be afforded many of the typical features of a Visa or Mastercard, such as purchase protection. You are, however, protected from any unauthorized charges to your account. All that said, this is a good option for those who spend a lot on Amazon, as most other options that we will look at have caps on the amount of Amazon spending that are eligible for rebates, whereas the Amazon Store Card allows for unlimited cash back. How is this relevant? It turns out that Amazon purchases, provided they are directly from Amazon and not a marketplace vendor, qualify for the 5% bonus. One workaround for marketplace purchases is to first buy an Amazon gift card, then use that to pay marketplace vendors. Using this workaround does have the downside that you’ll lose out on the protections and benefits, such as extended warranties, that you get when you make a purchase with a credit card. Once you’ve earned 2,500 reward points, you can cash them out in the form of a $25 statement credit, have it applied to your eligible Sallie Mae student loan or redeem it as cash back in a Upromise account. For those who spend less than $750/month at Amazon, this card is a nice option, especially since it offers 5% on both groceries and gas as well. The US Bank Cash+ Visa Signature Card, along with the Sallie Mae Card, is another one of the cards that made our Best Cash Back Credit Cards list. Of special note is that one of the 5% categories that you can select are bookstores. And fortunately, Amazon purchases indeed do qualify as bookstore purchases. People with old versions of the Citi Forward card can also earn 5 points per dollar spent at Amazon, but that card is no longer available to new applicants. 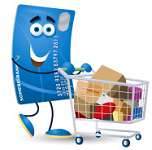 Cards such as the Chase Freedom and Discover it offer quarterly rotating 5% categories, which typically once a year will cover Amazon.com purchases. For instance, during Q4 2014, the Chase Freedom card offered 5% cash back at Amazon.com and the Discover it card offered 5% on online purchases, which included Amazon. Note that the 5% bonus is limited to $1,500 in spending per quarter for both cards. Finally, there is another option which requires more hassle. It involves using credit cards that earn 5% in certain categories and buying Amazon gift cards. For instance, the Chase Ink Plus earns 5 points per dollar spent on the first $50,000 spent in combined purchases at office supply stores, and on cellular phone, landline, internet and cable TV services each year. So, when you purchase Amazon gift cards from Staples or Office Depot, you’ll earn 5% back on the gift card purchase. Similarly, if you have an Amex Blue Cash Preferred, you can earn 6% cash back at supermarkets on up to $6,000 per year in purchases, although it does carry an annual fee of $75. So, if your local grocery store carries Amazon gift cards, you can earn a 6% rebate by purchasing them on your Blue Cash Preferred card. As was previously mentioned, in addition to the hassle involved, another disadvantage of buying discounted gift cards is that you will sacrifice any benefits that you would get from buying with a credit card, such as price protection or extended warranties. Most people looking for a credit card to use at Amazon will be best served with either the Amazon.com Store Card , the Sallie Mae MasterCard or the US Bank Cash+ Visa Signature Card. If you fall within their bonus spending limits, the Sallie Mae and the US Bank Cash+ cards are probably the better bet, as they are more generally useful cards, while still providing 5% cash back at Amazon. If you spend a significant amount at Amazon, however, and require an uncapped 5% rebate amount, then the Amazon.com Store Card is a good bet. There’s one big thing that changed over the years with their card. The “cash back” you get, when used in the traditional way of spending it on Amazon; has an odd restriction of not allowing you to shop with your points on pre-order items. So if you have even one item in your cart that isn’t out yet, you cannot redeem your cash back, thus it builds and builds until you decide to do an order without preorders. In my mind, preorders are much better handled online, as years of getting to the store and getting into arguments about what they were supposed to have in stock kind of made me insane. Amazon from Chase was the first credit card I ever owned, and my excitement to have it has dwindled significantly since then, thanks to the above, relatively new requirement, as well as more frustrating annoyances like the “Free” Super Saver minimum requirement increase from not so long ago. Oh, and let’s not forget the idiotic blank checks Chase mail you every month that you cannot opt out of, and the terror that goes along with the thought of them eventually and inevitably going to the wrong mailbox. It’s still not as embarrassing as eBay’s credit card though. I wish that pain on no other person.